When we first saw the apartment, we were excited that it had a yard but disappointed that the yard was filled by a large jungle gym that we didn’t need. Later, when we signed the lease, we were happy about the jungle gym because I’d learned that I was pregnant and we could imagine its uses. but by the time we moved in, we had found out that the baby’s heart had stopped and now it just made us sad to look out the window at it. They were in the coffee shop that day he asked her. When were you the happiest? Something she should have seen then, something about the look on his face, the way the air changed in that moment. The Yoga People always travel in pairs, their mats under their arms, their hair severely shorn in that new mother way. But what if someone sucker punched them and took their mats away? How long until they’d knuckle under? The fragments are beaded together by a thin, almost transparent thread of narrative: they meet, they marry, they have a child, things get tough, he has an affair, they work through it. This story in itself is commonplace, predictable, even trite — one way or another, it has been told over and over. Each time we revisit it, the interest has to arise from how it is told this time, about these people. For instance, they and their marriage, their child, their affairs, could be made rich with interest and significance, taking us deep into an experience we have not understood in this way, in this place. Contexts could be explained, characters attentively developed, personal stories woven into complex histories. The single thread could become part of an elaborate tapestry. 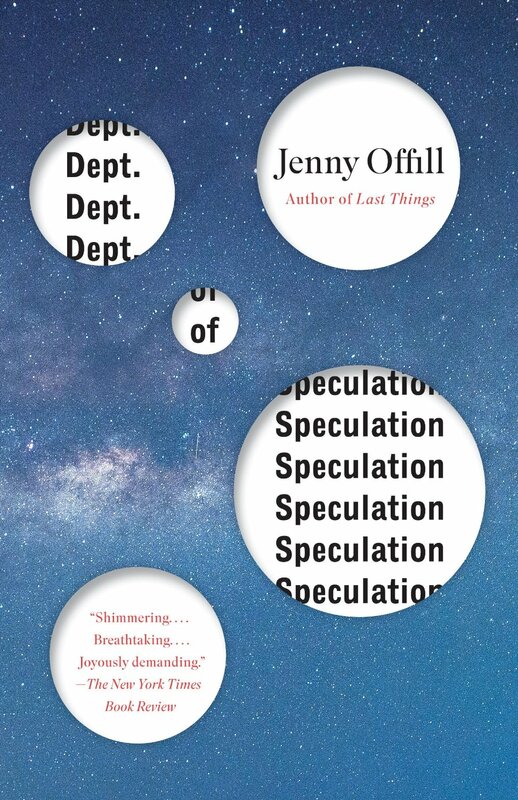 Or there’s Jenny Offill’s strategy, which is to tell us less, rather than more, to leave the thread exposed, unsupported, and hope that the colors and textures of the pieces strung along it will be enough for her readers. Suggestion or implication, not explanation; parts, not wholes; moments, not meaning. No explication, no context, no names. What happens, in between one paragraph, or one chapter, and the next? Figure it out — and you will, but that’s not the point, that’s the plot, and instead what matters is the writing. What there is of it. Fall comes early here. And it is unnerving to see so many stars. At night, the wife lies awake worrying about bears and chimney fires. About the army of spiders that live within. The husband wants goats. The daughter cries for Brooklyn. But my own word “excerpt” gives away my frequent impatience with Dept. of Speculation, my resistance to its tricks. It is also a mistake, after all, to assume that because something is elliptical, it is profound. And it’s hard work to write the whole novel, at least as hard as it is to polish up its most beautiful or memorable shards and lay them out just so. A novel that sustained the kind of shimmering intensity of the best bits of Dept. of Speculation would be spectacular — and it would be one organic thing, instead of a collection of self-conscious impressions, a construction that’s always calling my attention back to its own artfulness. Look at me, going here and then there, alluding, gesturing, refusing to fill in the blanks — but did you notice (yes, I did) that it shifts from first-person plural to third person and then back again, as the relationship falters and then repairs? It’s very good on the sleep-deprived hysteria of early motherhood, though. And bedbugs. This may be the first review of Dept. of Speculation I’ve read that isn’t gushing. Technically the novel seems so deft, so capable, with so many lines that limn certain contemporary experiences (at least those of well-off Brooklynites). But stepping back a bit – also how tiring – another American program novel that puts its weight on craft over substance and that even features a creative writing teacher as narrator! I suppose that was the point – to take the most mundane, typical American program fiction subject matter and try something new with it. But then, doesn’t that just turn the work into aesthetic experiment when, all around us, there are so many critical elements of American life just begging for a writer to engage them? I’m being a bit unfair to Offill – not everyone can or should be a Baldwin or Steinbeck or Cather – but when an American novel gains so much critical praise, I start to set my expectations high. Yes, having The Wife be a writing instructor felt very cliched, and like one more way of making us think all the time about how the book was written. Call me old-fashioned (“OK!” say the novel’s many rapturous admirers) but I like a novel that doesn’t end up feeling solipsistic. Everything I liked about Dept of Speculation, After Birth by Elissa Albert did so much better. What I like about the Offill though was that it was short—not being flippant. It was weird and frustrating, but because it was short, I could read it twice and get a better understanding. But I do appreciate your review, and another point of view on this book.